The Baltic Yachts built 66.7m sailing yacht Hetairos (project name Panamax) has successfully completed her first sea trials. Dykstra Naval Architects were part of an international team of experts that came together to make this special project a success. 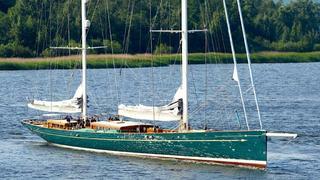 Her design features a plumb bow, long bowsprit, a traditional sheer line and long overhang. A lot of attention has been given to the styling and design of the classic deck joinery, fabricated with the latest low weight and high tech materials. Similarly, for her interior, Rhoades Young Design undertook extensive research in order to design a ‘ground breaking’ light-weight interior. Hetairos is planning to take part in various international regattas and events. The combination of comfortable cruising and high performance racing make her one to look out for on the water.